Yesterday, The Register published what it claims is the story that led GCHQ to destroy the Guardian’s hard drives: the location of a key GCHQ base in the Middle East and its relationships with British Telecom and Vodaphone. The secret British spy base is part of a programme codenamed “CIRCUIT” and also referred to as Overseas Processing Centre 1 (OPC-1). It is located at Seeb, on the northern coast of Oman, where it taps in to various undersea cables passing through the Strait of Hormuz into the Persian/Arabian Gulf. 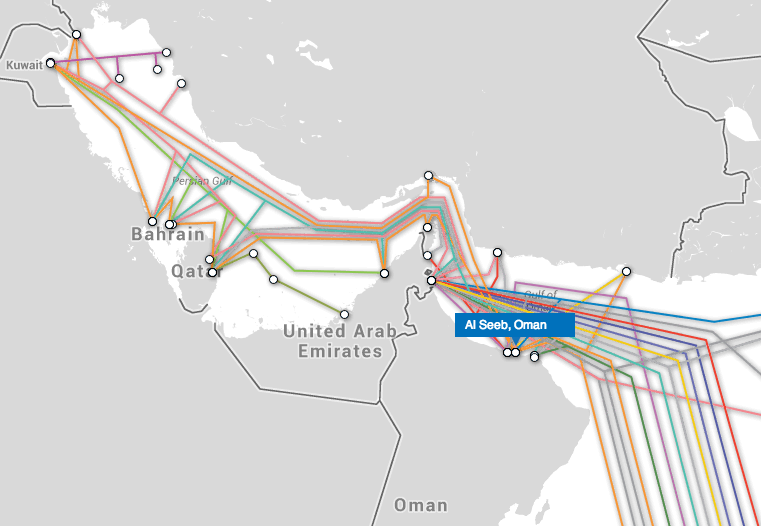 Seeb is one of a three site GCHQ network in Oman, at locations codenamed “TIMPANI”, “GUITAR” and “CLARINET”. TIMPANI, near the Strait of Hormuz, can monitor Iraqi communications. CLARINET, in the south of Oman, is strategically close to Yemen. British national telco BT, referred to within GCHQ and the American NSA under the ultra-classified codename “REMEDY”, and Vodafone Cable (which owns the former Cable & Wireless company, aka “GERONTIC”) are the two top earners of secret GCHQ payments running into tens of millions of pounds annually. The Brits would have you believe — and I have no reason to doubt them — that this cable landing in Oman is one of the key points in their surveillance infrastructure. I raise this because of a cable listing the globe’s critical infrastructure — and fearmongering surrounding it — that Chelsea Manning leaked to Wikileaks. As I noted at the time, while the cable lists a slew of cable landings as critical infrastructure sites — including the Hibernia Atlantic undersea cable landing in Dublin, which gets mentioned in the Register story — it does not list a single cable landing site in the Middle East. Ras Laffan Industrial Center: By 2012 Qatar will be the largest source of imported LNG to U.S. Note, Bahamas’ telecom, which recent reporting has also noted is critical to NSA’s spying, also gets no mention. That’s not surprising in the least. The cable (and the list) is classified Secret. NSA and GCHQ’s prime collection points are (as the Register notes) classified several levels above Top Secret. And while the list provided some indication of what sites were significant by their absence, it’s likely that the sites that were listed were the relatively unimportant sites. At trial, Manning’s lawyers repeatedly point out that she had chosen not to leak stuff from JWICS, which would be classified at a higher level. The stuff she leaked, which she got on SIPRNET, was by definition less sensitive stuff. I don’t mean to suggest this reflects on the relative value of what either Edward Snowden or Chelsea Manning leaked. I think it is a good indication, though, of how unfounded a lot of the fear mongering surrounding this particular leaked cable was. I assume that the government of Oman “sells” its cable access, to the government of the UK, in return for something that the government of Oman considers to be of value to it. The underlying concept of a “country”, with its “people”, doesn’t really come into play in such a transaction. And things like eliminating privacy, trampling on commercial rights, and screwing yet other countries, are irrelevant. It’s just one ruler, cutting a deal with another ruler, to serve the two rulers’ personal interests. Has it always been thus? Any historians out there?